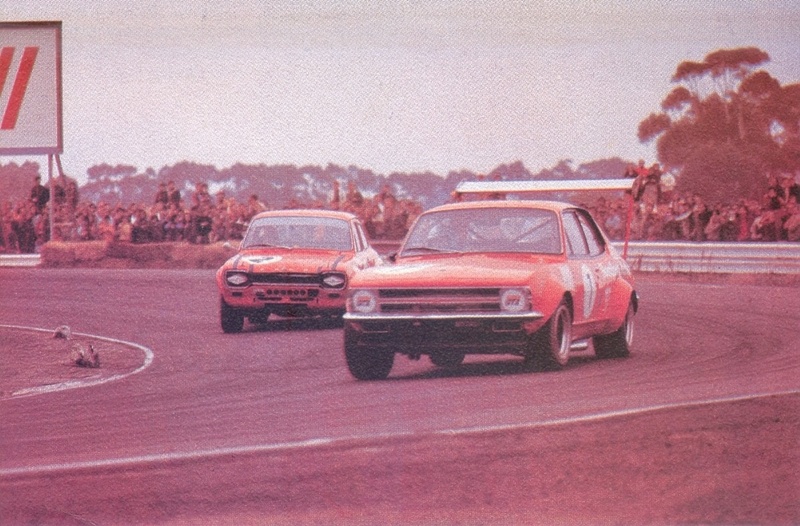 The Tommy Torana is of no interest other than that GMH are promoting a mid-spec Torana-Six rather than the huffin’ and puffin’ 202 GTR-XU1, surely one of Australia’s finest all-round touring-car racers on tarmac and dirt? 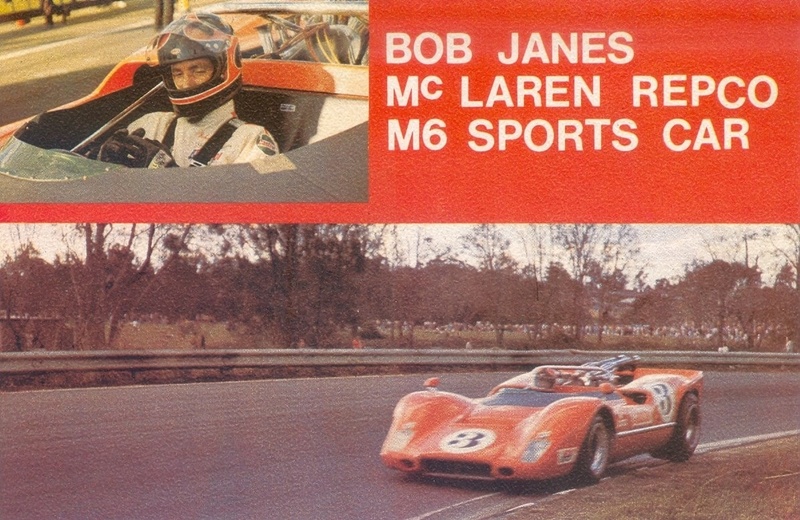 Two of Bob Jane’s cars form the backdrop- the Tasman Formula Brabham BT36 Waggott 2 litre and McLaren M6B Repco 5 litre ‘740’ V8 sports-racer. 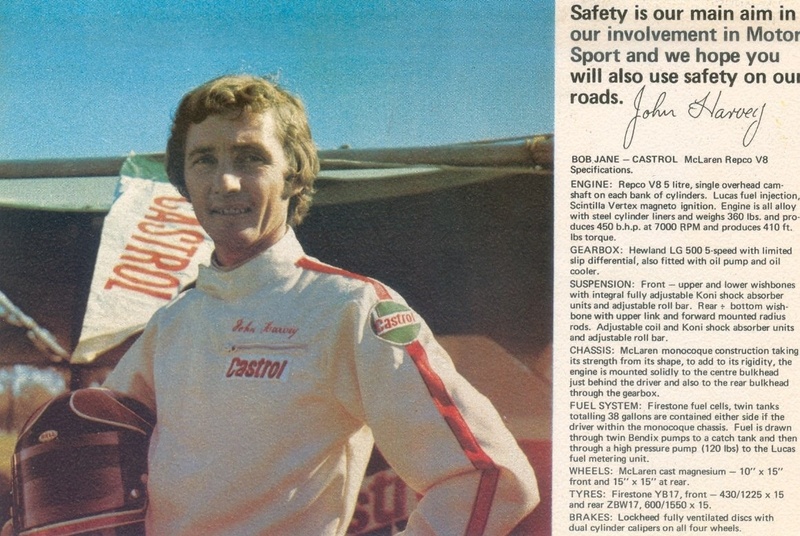 John Harvey raced the Brabham and both Harves and Jano shared the one of a kind, Repco powered McLaren- albeit it was with John at the wheel that the car won the 1971 and 1972 Australian Sportscar Championships. Both cars are superb jiggers and still extant, the McLaren still in Australia and owned by Bob (ongoing family litigation duly noted). 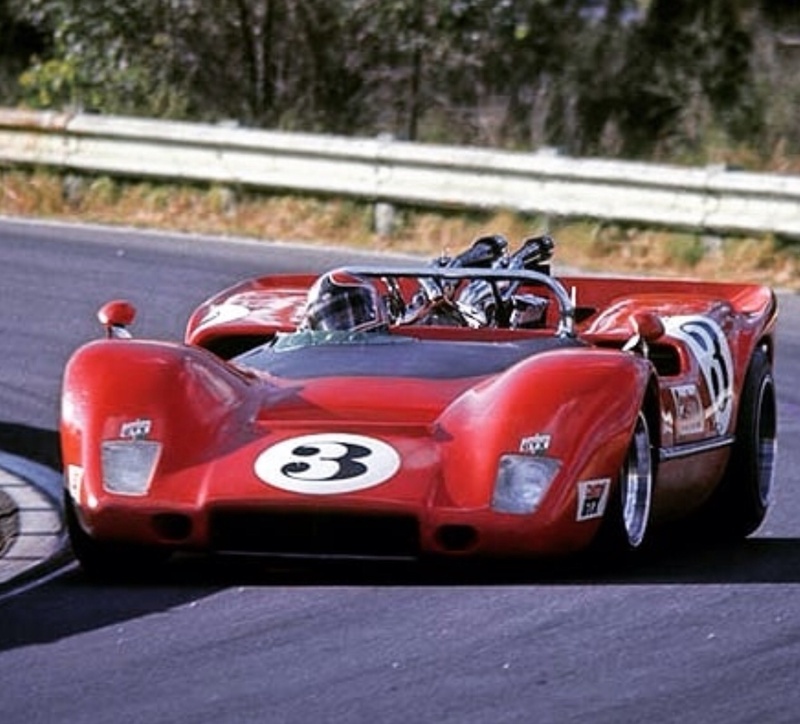 Jane’s taste in racing cars down the decades has been flawless, his machines included but are far from limited to a Maserati 300S, Jag XKD, Jag E Lwt, Elfin Type 100 ‘Mono’ Ford, Brabham BT11A Climax, Elfin 400 Repco, Brabham BT23E Repco, the Rennmax built Jane Repco, Bowin P8 Repco, Ralt RT4 Ford plus twenty or so touring cars/sports sedans the most mouth watering of which were the Shelby built Ford Mustang, John Sheppard built Holden Torana GTR-XU1 Repco and Holden Monaro GTS350 and Pat Purcell constructed Chevy Monza. Lets not forget the Porsche 956 tho it was a lease deal not a car he owned. 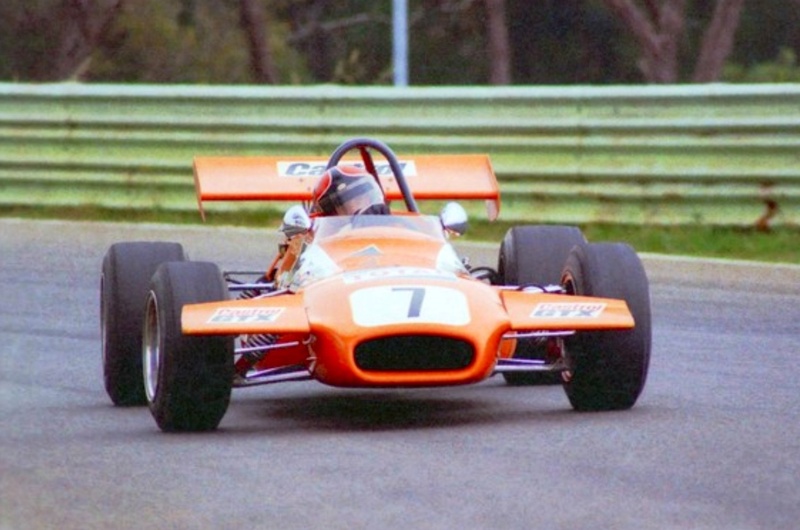 I’ve lost touch with exactly which cars he retains but I think the scorecard includes the Brabham BT11A, Ralt RT4, McLaren, Monaro and a 635 CSI BMW rings a bell- be great to hear from those who know. 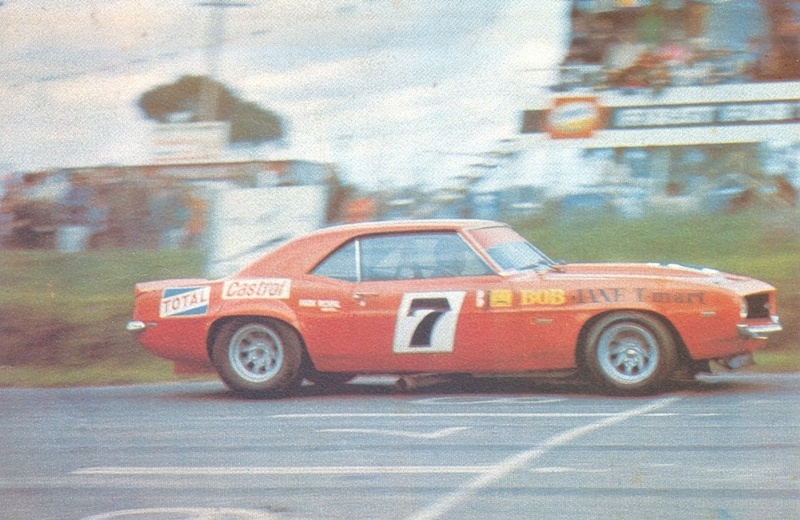 Many other fellas raced these cars other than Jane- the uber successful businessman put way more into racing than he ever extracted- the tabloid family stoushes of recent decades are a sad final chapter in a great mans life. Sandown old-timers know this bit of real estate rather well. The racers are facing the wrong way in the pitlane, the models are standing more or less on the spot, depending upon your car, that brakes and a downshift or two into second gear would be considered for the ‘Peters’ or ‘Torana’ (depending upon your era) left-hander and then the blast up the back straight. 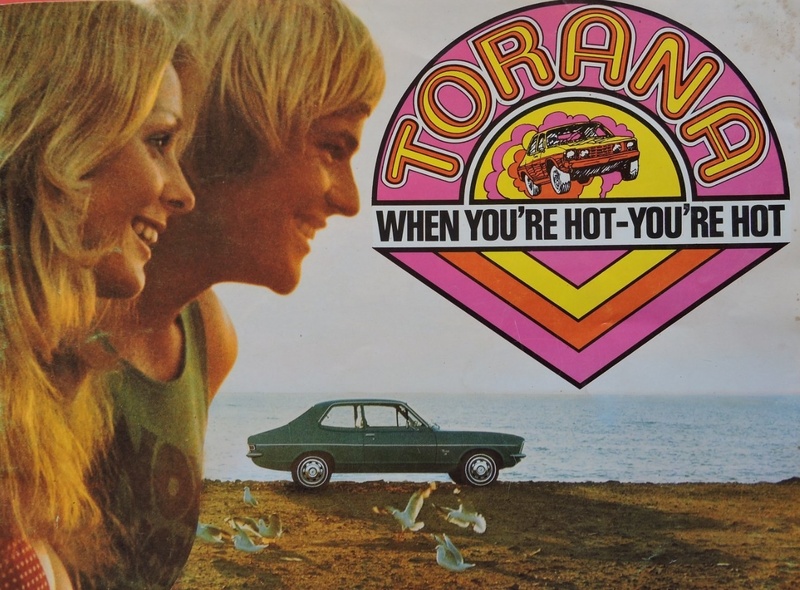 ‘When You’re Hot- You’re Hot’ absolutely captured the performance variants of the Torana at the time- the GTR ‘poverty pack’ and ‘ducks-guts’ GTR-XU1. 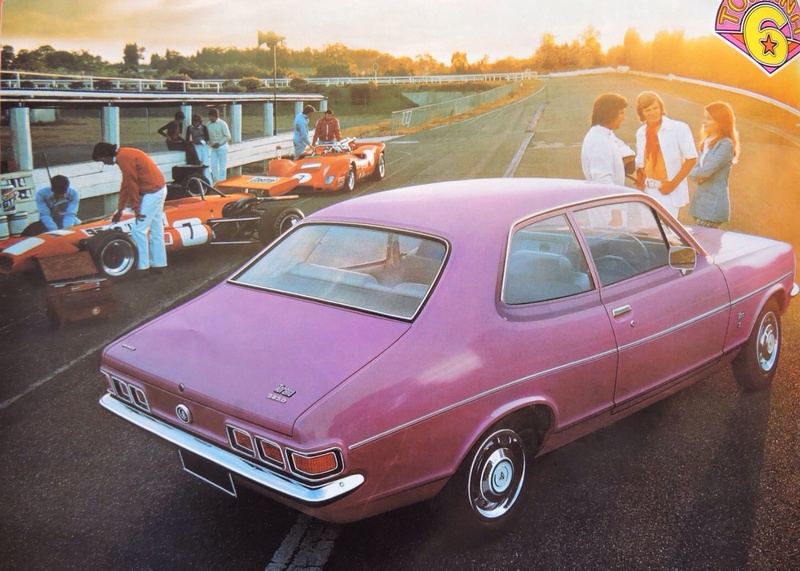 But, at fourteen years old at the time, overall I thought ‘Going Ford Was The Going Thing’! 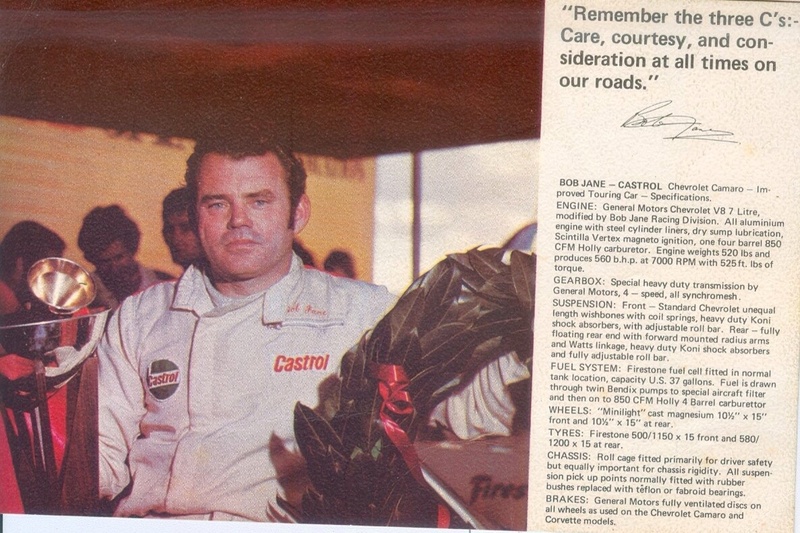 Fords ‘Total Performance’ approach to motor racing globally was intoxicating for a teenaged racing nut- this one anyway! 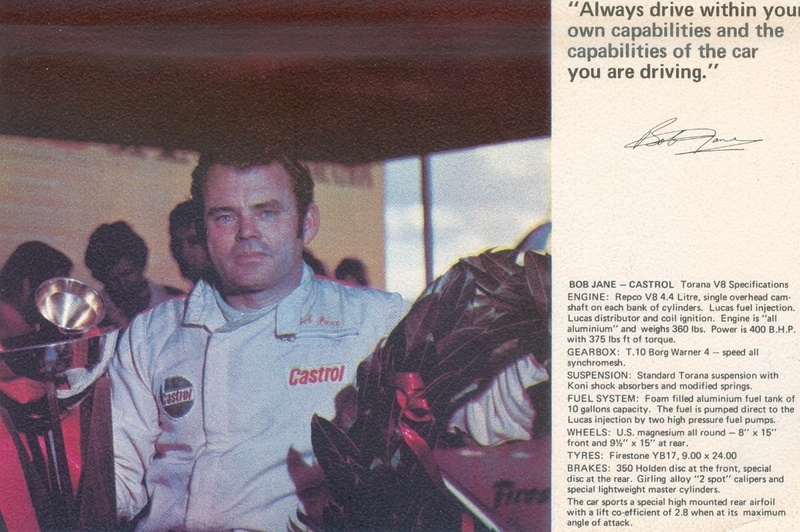 In good hands with those guys- must admit I don’t care about the taxis but it would be great to see the Brabham, McLaren and Ralt out every now and then. He really has had an extraordinary array of cars since the mid-fifties hasn’t he?